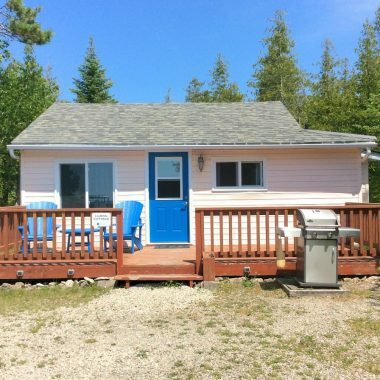 All cottages feature free satellite TV, Keurig coffee machines, private waterfront location, decks, propane barbecues and fire-pits. All cottages were furnished with brand new mattress sets in 2017. All bedding, towels and linens are provided. Each cottage has an electric fireplace for those cool Spring / Fall evenings. Upgraded wi-fi service in Spring 2018 means free connectivity available in all cottages and from all common areas of the grounds. Choose from a variety of cottage sizes and sleeping arrangements. From $130/night Spring and Fall or from $190/night Peak Season. Weekly rates are available. 1000 square foot cottage. Waterfront location. Two Queen beds. Sleeps Up to Four Adults and Two Children. Waterfront Location. Two Queen beds. Sleeps Four. Waterfront Location. Two Queen Beds, Sleeps Four. 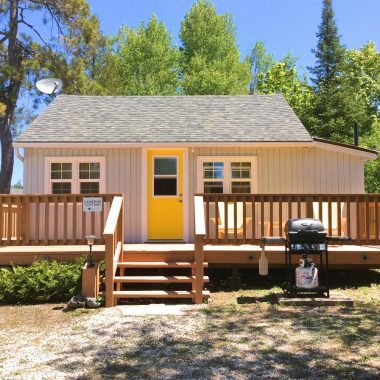 Cozily nestled on the pristine shoreline of Lake Huron, Neptune’s Hideaway is just minutes away from the heart of Tobermory with its wealth of activities, as well as the Tobermory to Manitoulin Island Ferry Service. 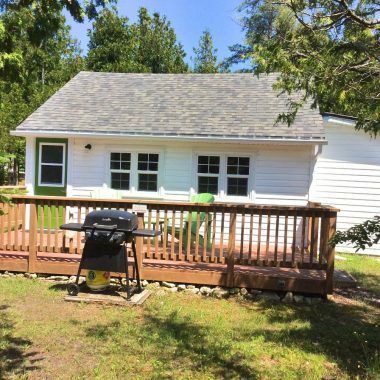 Close to the Bruce Trail, and both Cypress Lake and Bruce Peninsula National Parks, you are never far from the action while staying at Neptune’s Hideaway. After spending a busy day exploring the natural beauty of the Bruce Peninsula, why not spend a quiet and relaxing evening in a private and peaceful setting away from the crowds. 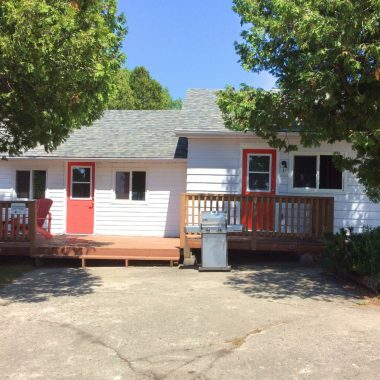 Nestled on eight acres of pristine waterfront property, we have four beautifully appointed two bedroom private cottages, each with a fully equipped kitchen, Keurig coffee machine, three piece bathroom, living room, deck, fire pit, BBQ, cedar picnic table, resin adirondack chairs. We offer free wi-fi and satellite TV. In a bush and shoreline setting looking out at Lake Huron, our guests appreciate their peaceful and tranquil surroundings. Stroll the shoreline, fish, kayak or take a walk in the woods. Our seasons are always busy, so we suggest contacting us early to ensure your place in Tobermory’s most unique home-away-from-home setting. You owe it to yourself and your family to come up and experience Tobermory while staying at Neptune’s Hideaway.